1968 There was a quantity of 4118 California Special (GT/CS) hardtops built in 1968. They had the same rear taillight panels and spoiler as the Shelby, fiberglass side scoops, stripes, blacked out grille, fog lights, hood locks, but did not come standard with the 1968 GT options package although 8 percent were ordered with a subset of them. All GT California Specials were built at the San Jose assembly plant and were offered with any engine and paint combination. 2007 The 2007 Mustang GT-CS California Special is a GT Premium options package which includes unique California Special contracting Dove or Parchment "GT Leather" inserts on leather sport bucket seats, CS badged floor mats, unique front fascia, larger air intake, a chin spoiler that is 1.5 inches lower than the standard GT, unique rear fascia with a race car like "diffuser", side scoops, bright rolled exhaust tips, and GT-CS tape stripe. 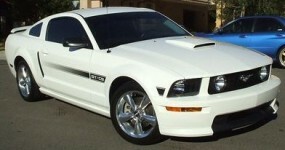 2008 The 2008 Mustang GT/CS California Special consists of a $1,895 GT California Special options package which includes California Special side tape stripes, 18-inch polished aluminum wheels with a pony center cap and 235/50/ZR15 tires, and front floor mats with the Mustang logo. The 2008 GTCS is only available in the coupe. 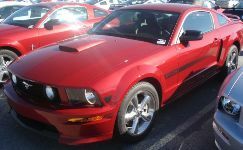 2009 The 2009 Mustang GT/CS California Special package is available on the Vista Blue, Performance White, Dark Candy Apple Red, Black, and Vapor Silver Mustang GTs for both the coupe and convertible body style. Previous years, the GTCS was only available in the coupe. It consists of California Special side tape stripes in black or white, special front and rear body treatment, side scoops, chrome exhaust tips, 18 inch polished aluminum wheels, and either Parchment or Dove colored seat inserts. 2011 The 2011 California Special GT with chrome billet grille with body color surround and tri-bar offset pony badge, side stripes, lower fascia with fog lamps, 19 x 8.5 inch machined painted wheels, decklid California Special badge, door panel carbon inserts, front and rear leather seats with carbon inserts, premium carpeted front floor mats with embroidered pony logo, rear diffuser-style lower fascia, pedestal spoiler, decklid graphics, and side scoops. 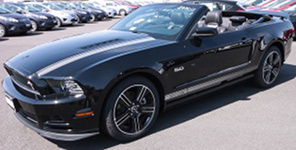 2012 The 2012 Mustang GT California Special is a GT coupe or convertible upgrade which includes a billet style grille, upgraded wheels, and a GT/CS side stripe. 2013 The 2013 Mustang GT/CS is an upgrade package for the GT inspired by the 1968 Mustang GT California Special which came back in 2007. 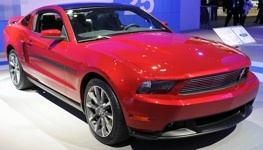 In 2013 the Mustang GT/CS receives new stripes, wheels, side scoops, and spoiler on top the newly designed GT vented hood, grille, and tail lamps. 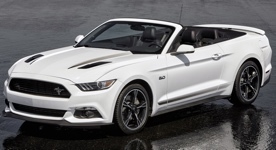 2014 The 2014 Mustang GT/CS is an upgrade package for the GT inspired by the 1968 Mustang GT California Special. 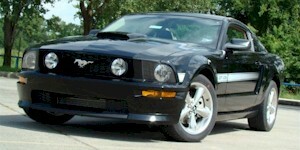 Includes unique black billet-style grille, unique lower fascia with fog lamps and air splitter, 19" black-painted machined aluminum wheels with P245/45R19 tires, GT/CS side and hood stripes, black hood vents, unique decklid badge with name in gas cap badge, unique instrument panel finish and door-panel inserts, leather-trimmed front bucket seats with Miko Suede inserts, premium carpeted front floor mats with embroidered logo, rear diffuser-style lower fascia, pedestal rear spoiler, and side scoops. 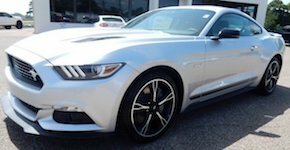 2016 The 2016 Mustang GT/CS is an upgrade package to the Mustang GT which includes unique hood and side stripes, unique front grille with off-center tri-pony emblem, unique wheels, rear decklid California Special badge, dash badge, and engine badge to name a few. 2017 The 2017 Mustang GT/CS is an optional package for the GT which includes 19" ebony black painted machined aluminum wheels; unique performance front air splitter, unique black front grille, hood and side stripes; strut tower brace; black-painted raised blade-style rear decklid spoiler, sideview mirrors and hood-vented air extractors; GT/CS rear decklid badge; unique dark taillamp bezels; leather-trimmed seats with Miko suede cloth inserts and red stitching; diamond plate aluminum instrument panel trim; and premium carpeted front floor mats with red stitching. 2019 The 2019 Mustang GT/CS or California Special is newly designed with a side fading GT/CS side stripe, rear decklid California Special badge in black and race red, blacked-out open grille, the Mustang Performance Pack 1 splitter, unique five-spoke painted machined wheels, and side scopes. On the inside there are black Miko suede-trimmed seats with GT/CS lettering and red accent stitching, GT/CS floor mats, and a California Special dash badge.